10:15pm Update: Hurricane Joaquin now a Category 3 hurricane with maximum sustained winds of 115 mph. Several weather features in the atmosphere will all work together to potentially bring a major land falling hurricane to the East coast late this weekend. 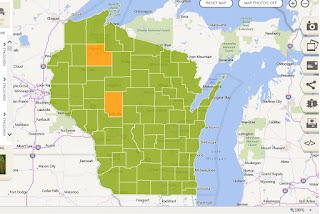 But the effects of that hurricane will also have an impact on what happens in the Great Lakes as well. Now a Category 2 hurricane, Joaquin continues to strengthen in the Atlantic just east of the Bahamas with Hurricane Warnings in effect for the island and surrounding waters. Hurricane hunters have measured winds within the storm at 105mph, central pressure of 954mb and currently moving to the southwest at 7mph. A shift to the northwest is expected within the next 24 to 36 hours, before moving towards the Mid-Atlantic. The image to the left is the current forecast track of Hurricane Joaquin from the National Hurricane Center. It's extremely important to note that this is a *forecast* and that things could change. However, I do not believe that a shift to the east and further away from land is likely. And the reason for that is because of what's happening near Bermuda and what will develop in the southeast by Thursday. High pressure near Bermuda will help steer Joaquin to the west as winds around high pressure flow clockwise. At the same time, winds within the jet stream will help steer the storm north, along the eastern seaboard. The net effect this will have on our weather locally will be to hold on to the chill a little longer. Hurricane Joaquin will cause a traffic jam in the atmosphere, essentially not allowing systems in the west to move east until the hurricane weakens and moves into the North Atlantic. This means we continue with the chilly pattern for a while, but it does look like temperatures will rise back to normal as early as next Tuesday/Wednesday - which is in the middle to upper 60's. Hurricane Joaquin becomes the third hurricane this year for the Atlantic; becoming a hurricane this morning. Now hurricane watches and warning are in effect for the Bahamas, including Nassau and Freeport. Winds are now sustained at 75mph with Air Force Reserve Hurricane Hunters measuring the wind speeds. This new information prompted the warnings from the NWS. Joaquin is expected to intensify with warm ocean temperatures in the Caribbean and weakening wind shear, and could reach category three status. Right now Joaquin will impact the Bahamas through the weekend, but the track after that is very uncertain. That's because it will interactive with an upper level trough and stalled front, so it is hard to determine whether or not there will be direct impact with the East Coast. However, whether on not there is a direct hit, the East Coast will still be greatly impacted by the tropical moisture, allowing for more very heavy rainfall. A look at the 7-day precipitation forecast shows extremely heavy rain and the threat for flash flooding. Low pressure in the southeast continues to bring heavy and flooding rain to the Mid-Atlantic and East coast Tuesday evening, with the heaviest falling tonight into Wednesday morning. The cold front that passed us this morning will push that rain further into the Atlantic, only for the coast to be hit with another, and stronger, low pressure system by the weekend. Tropical Storm Joaquin has developed in the Atlantic with maximum sustained winds now of 65 mph, currently moving west/southwest at 5mph. Many along the East coast are watching that Tropical Storm, along with a forecast cut-off low expected to develop Thursday in the southeast. Tropical Storm Joaquin is expected to strengthen to hurricane status as early as tomorrow afternoon as a Category One hurricane. While it isn't expected to have a direct hit on the East coast, the cut-off will pull tropical moisture from the storm northwest as it moves up from the southeast to the Mid-Atlantic and Northeast by Sunday. Forecast 7-day rainfall totals predict nearly 10 inches of rain falling for areas like Boston, New York, New Jersey and Rhode Island. The steering winds in the atmosphere feature strong high pressure over the northern Great Lakes and in Bermuda. Unfortunately, that doesn't leave much room for either low with the East coast almost in the direct line of path. As the surface low strengthens in the southeast late this week, strong winds will provide flooding and beach erosion for coastal areas. While we remain dry through the week, some of that moisture could get pulled this far west depending on how far inland the low tracks. If that were to happen, light rain and cloud cover is a good bet for late Saturday and Sunday afternoon. It would also mean our temperatures would stay cold with highs only near 60 degrees. Why So Breezy & Chilly This Week? A cold front has moved through the Stateline this morning, and that is allowing the winds to shift from south to northeast. This means much cooler air is filtering into the region from the north. These winds will continue all week and will be blustery essentially for the entire period through the weekend. But why is that the case? Well, it is because a low pressure system (Tropical Storm Joaquin) is going to get caught up with a cold front along the east coast and stall out. That, in tandem with a high pressure system moving in from the north, is going to create an area with a tight gradient (the region in cyan on the map above). Basically, a tight gradient is an area where winds are stronger because there are differing pressures (highs and lows) on each side of the gradient. The fact that the low is going to stall out means the high pressure system will have nowhere to go. Therefore, we are going to remain in the blustery region of this setup through the entire week when the low on the east coast finally begins to move northward. 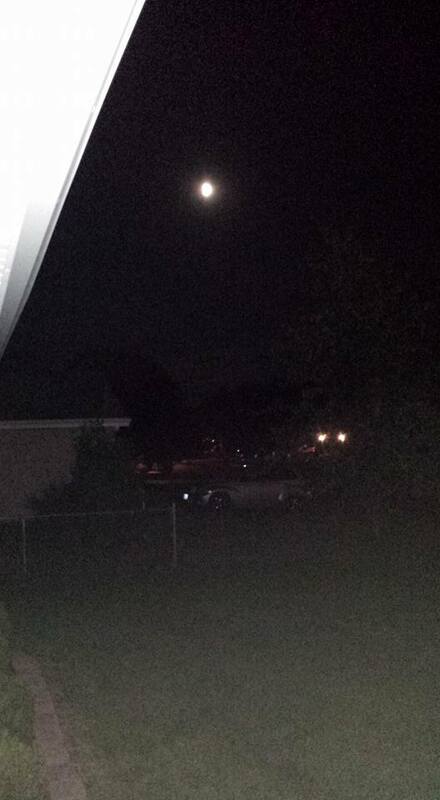 The clouds broke just enough for temperatures to reach the low 80's in Rockford, upper 70's in many other spots. But this will more than likely be the last 80 degree day of 2015 as cooler fall air is on the way. Is it possible that temperatures will warm back into the 70's? It is, but climate tells us that our days are numbered as the average high drops from the upper 60's in the beginning of October to the middle 50's by the end. but the general trend is for temperatures to cool. With the shorter days and lower sun angle in the sky, we're not able to maximize our heating, causing temperatures during the fall and winter to cool - reaching climatologically the coldest three month period of December, January and February. Once the earth begins to tilt back towards the sun, our days turn longer and warm up. 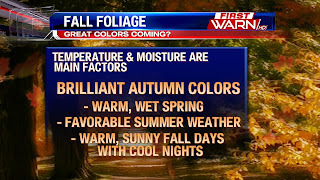 Now this doesn't mean all gloom and doom as we have some very nice fall days to look forward too. Let's just hope we're able to enjoy them before diving right into winter. A cold front is finally going to bring an end to our string of warm and dry days. That front is situated up in the Dakotas and Minnesota this afternoon and it will continue to push southward, eventually making it to the Stateline by late tonight. Associated with this frontal boundary are some showers. While there isn't much moisture to work with, nor will there be any thunderstorms, there will be some rain showers overnight tonight and Tuesday morning as the front makes its way through the region. It would surprise me if anyone received more than a tenth of an inch of rainfall from this. The bigger story revolving around this front is the colder air that is going to filter in behind it beginning Tuesday afternoon when highs only reach the middle 60's. This front has plenty of cooler air behind it up in Canada, and as it passes it will open up a gateway to allow that colder air to move on into the Northern Plains, Upper Midwest, Great Lakes, and Ohio Valley. You can also picture the jet stream shifting in this scenario. When you are south of the jet stream, typically you are seeing warm conditions. If you are north of it, you are in the colder section. For the past few weeks, we have been south of it, thus we've seen warmer air. After this front passes, the jet stream will form a ridge in the west (warmer air) and form a deep trough (colder air) across the east. In fact, the dip in the jet stream looks to make its way all the way to the Gulf Coast by later this week! So this all means cooler air will have its way with our forecast for the foreseeable future with colder than average highs expected for the area. Highs will likely remain in the middle to perhaps upper 60's throughout the period and lows will be in the 40's and perhaps upper 30's at times in the rural locations. 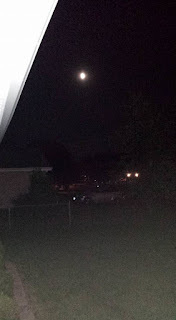 Moon pictures from Sunday night! 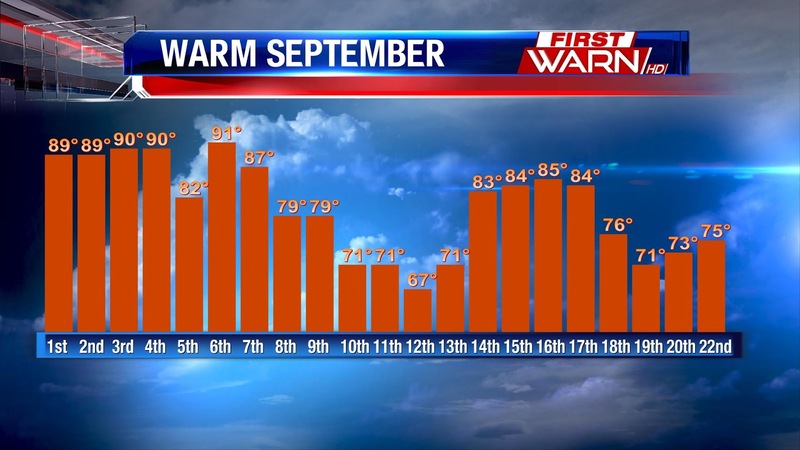 A relatively warm September will be ending on the cool side as temperatures fall into the 60's following Monday's high of 80 degrees. The front will come with showers, but then the rest of the week looks dry until the upcoming weekend. 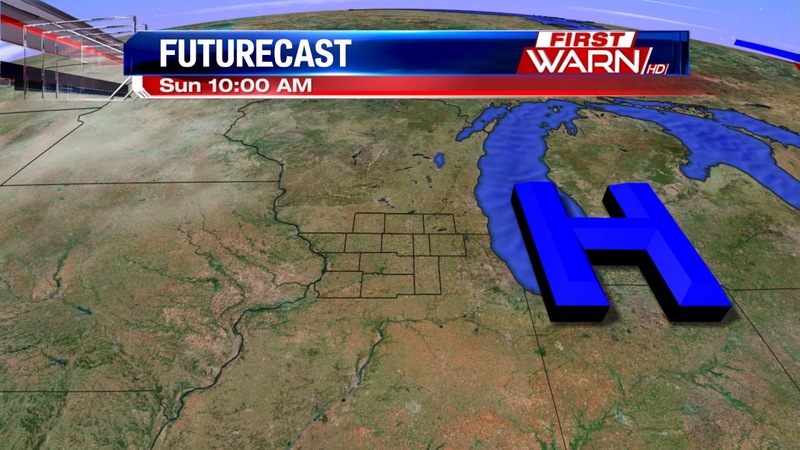 High pressure will remain anchored across the Great Lakes through the end of the week. This at the same time low pressure develops and lifts up the East coast. The difference in pressure between the two will cause east/northeast winds to increase after Tuesday. With the shift in wind direction, temperatures will take a tumble into the 60's and drop below average to begin October. We have been in quite the beautiful pattern for the past few weeks with plenty of sunshine and limited rainfall. Oh, and those temperatures, they have been pretty stellar as well. But, as they say, all good things must come to an end, right? That "rule" applies to our nice weather, but not before we squeeze out two more summer-like days across the Stateline on Sunday and Monday. Expect upper 70's on Sunday with partly to at times mostly cloudy skies. That means the viewing for the "Supermoon" Lunar Eclipse should be a-OK for the region with some clouds around, but not enough to obstruct the view. Monday will be similar with more in the way of sunshine and even warmer temperatures in the lower 80's for most of the area. Things begin to change, though, on Monday evening as a cool front from the north begins to edge its way closer to the Stateline. Showers will be associated with the front, but nothing in the way of thunderstorms or severe weather is expected. By Tuesday morning, the frontal boundary will be near the area and therefore, some showers are possible Tuesday morning and afternoon. The coverage of these showers will not be great, but many of us will see some light rain at some point on Tuesday. The bigger story with this system is the cooler air that will be brought down from Canada by Tuesday afternoon. High temperatures will be a good 10-18 degrees cooler on Tuesday as compared to Monday. That cooler air will remain in place throughout the entire week with highs expected to stay in the 60's each and every day through the weekend. Low temperatures will be in the lower 50's and even the 40's at times. It seems appropriate that fall-like weather arrives, though, considering we officially began fall this past week, right? Now that the "Supermoon" lunar eclipse is only two days away, it is time to give a cloud cover forecast for the Sunday evening. It looks as though a system that is moving onshore in the Carolinas will send rain as far west as the Indiana-Illinois border this weekend. 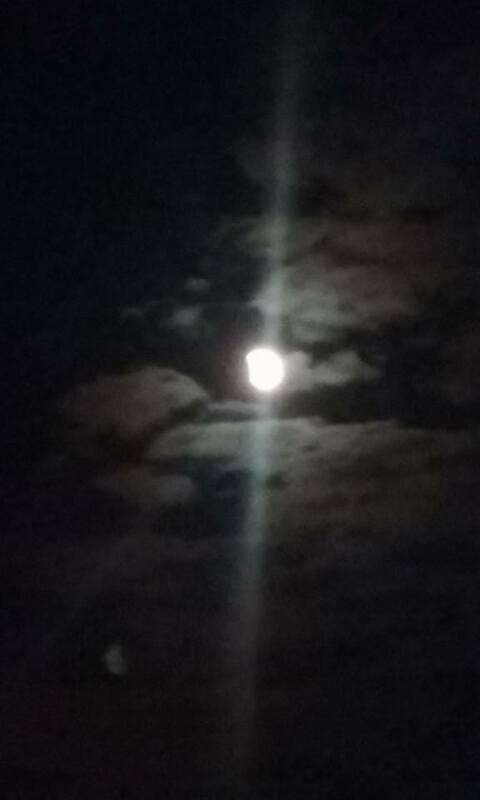 So I think the Stateline remains dry, but the system is so large that it will have plenty of cloud cover associated with it that will be sent our way for Sunday...just in time for the lunar eclipse. Now, while skies will not be clear, it does not appear as though skies will be completely overcast either. I think clouds will spread across the region on Sunday, making for a partly to at times mostly cloudy day. So, despite there possibly being more clouds than sun, I would be surprised if the entire viewing area didn't get a good view of the lunar eclipse blood moon on Sunday evening. 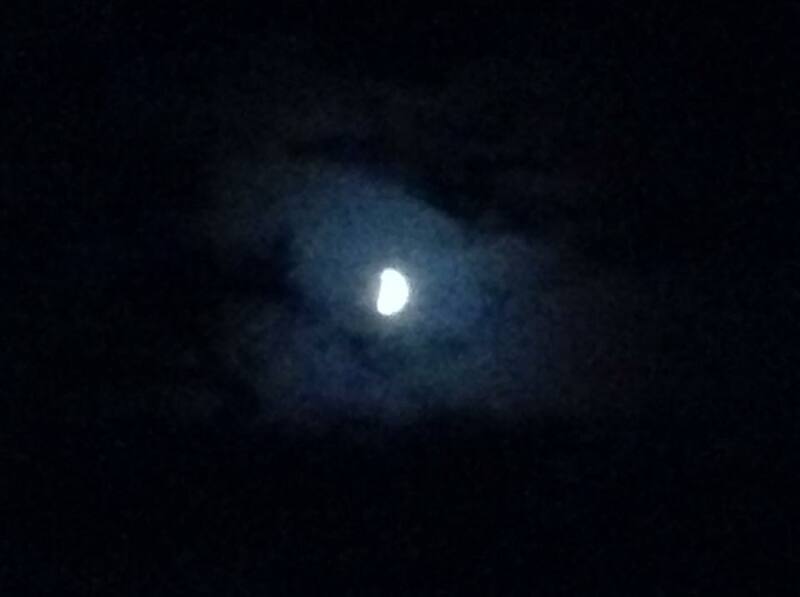 Remember, the eclipse starts at 8:07pm and ends at 10:23pm, peaking in intensity at 9:11pm. This event has not happened in 33 years, and it won't happen again for another 18 years. So I encourage you to get out and enjoy it if you have the time on Sunday evening because it will be awhile before it happens again. Developing low pressure in the southeast will bring heavy rainfall from Florida to the Carolina's Thursday night into Friday. Heading into the weekend, part of that low gets caught in the jet stream and is pulled into the lower Ohio and Mississippi River Valleys. Cloud cover will be expanding northward with the moisture into northern Illinois and southern Wisconsin. But the rain should stop short of Chicago Saturday and Saturday night. With a little more cloud cover heading into the weekend, it will limit how far our temperatures rise. Afternoon highs will reach the middle 70's. 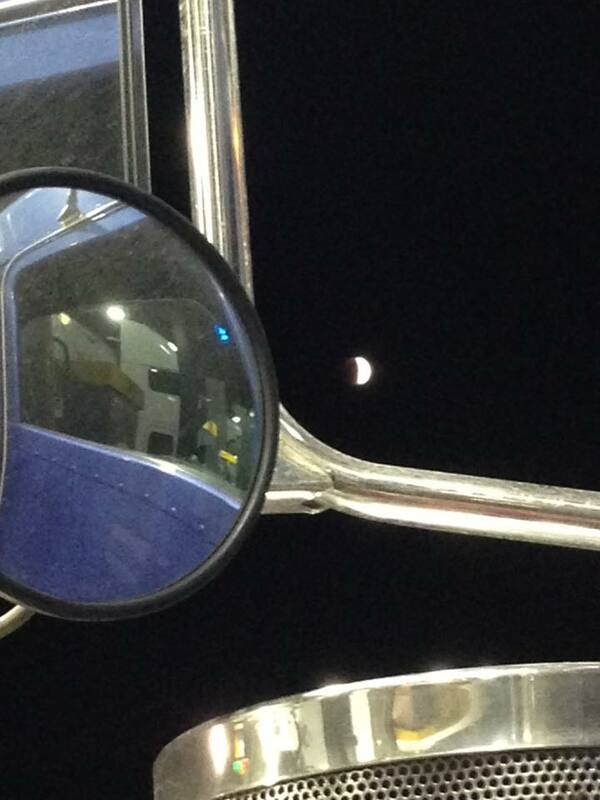 Let's hope we can clear out in time for the total lunar eclipse that is expected to take place Sunday evening! We have continued to be under the influence of a high pressure system that is located off to the east of the region. That has allowed the Stateline to remain in the "dry air" bubble, which essentially means moisture is having a difficult time moving close to the region from the west. The high pressure acts as a shield for us as it keeps the precipitation away. That is why we've been so dry of late, and why we will likely remain dry through early next week. Once we get to next Tuesday and Wednesday, things begin to change a little bit. A frontal boundary will be draped across Southern Canada and into North Dakota and Montana by Monday. This will be the focal point for some showery weather for those regions. The front will finally break down the drier air centered over the Midwest and Great Lakes by Tuesday as it continues to sag south. This means some scattered showers are possible on Tuesday and Wednesday as the front moves closer, and eventually moves through the region from north to south. Forecast models are in a disagreement regarding when the front moves through, and how much rain there will be with it. For now, I think it is safe to say some scattered light showers are possible both Tuesday and Wednesday. This appears to be the only significant rain chance for the next week or so, and the chances are not overwhelmingly high at this time. Also, it does not appear as though there will be much instability (energy) in place, which means our chances for thunderstorms are minimal. And, severe weather is not a threat with this system as it looks currently. 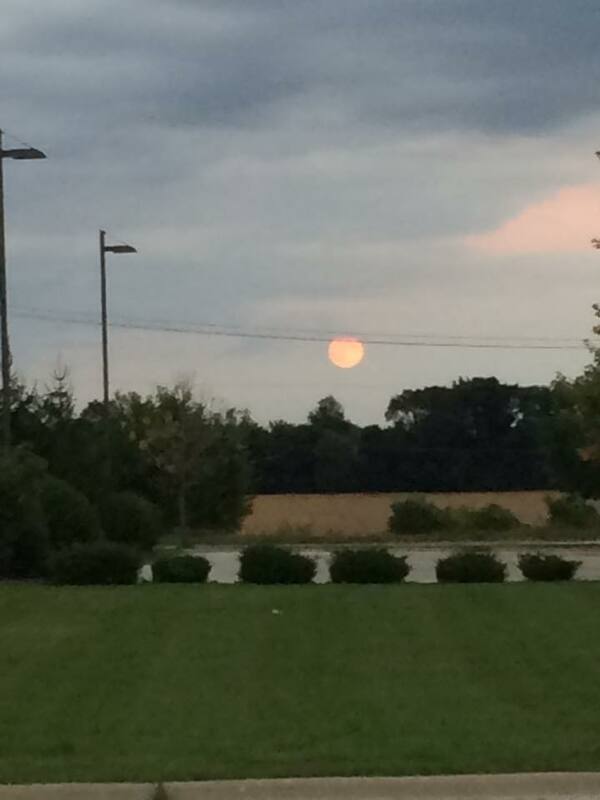 We are in for a special treat this weekend as the Harvest Moon is set to occur Sunday evening. 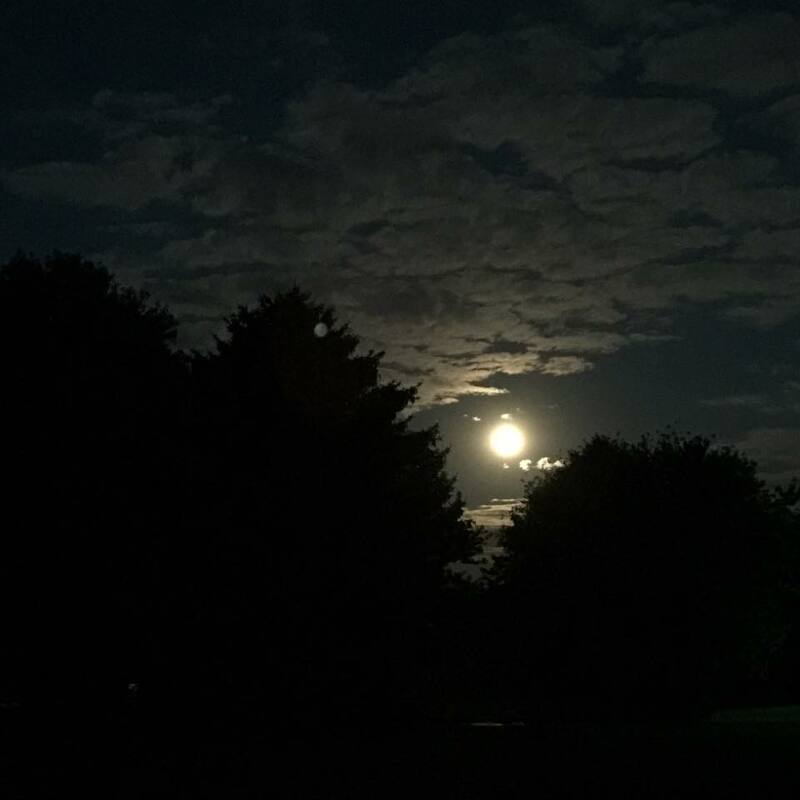 According to folklore, the Harvest Moon is the full moon that is closest to the Autumnal Equinox. 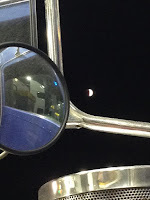 But the Harvest Moon this year will also be eclipsed! It will all begin at 8:07pm Sunday evening when the edge of the moon begins to enter into the Earth's shadow. The Earth's shadow will then move across the moon for the next 3 hours and 18 minutes, with totality beginning at 9:11pm and lasting for 1 hour and 12 minutes. Not only that, but moon will occur near the perigee of the Moon's orbit, or closet point to the Earth. 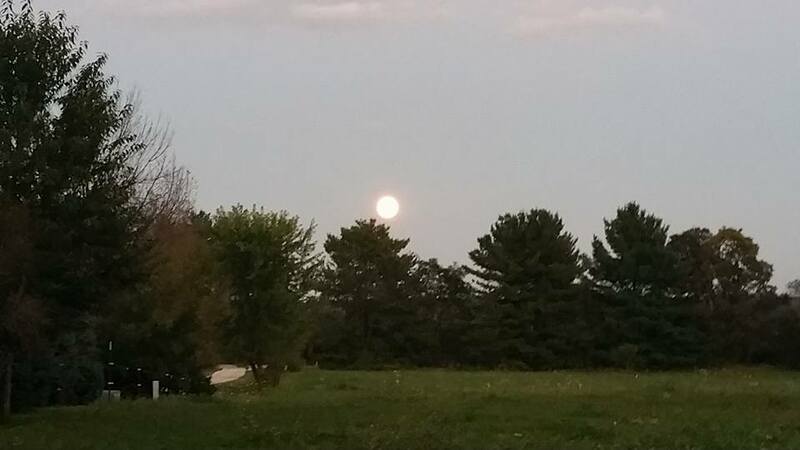 This will make this year's Harvest Moon a "Supermoon"! A sight you don't want to miss! 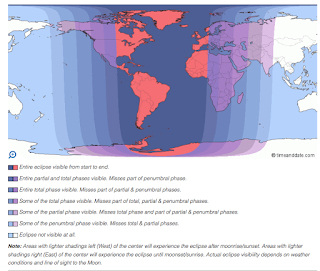 To the left is where the supermoon eclipse will be visible Sunday night. And as for the forecast, skies should stay partly cloudy, giving us at least a decent chance of seeing something we haven't seen for quite some time! The autumnal equinox kicked off fall this morning at 3:21am! 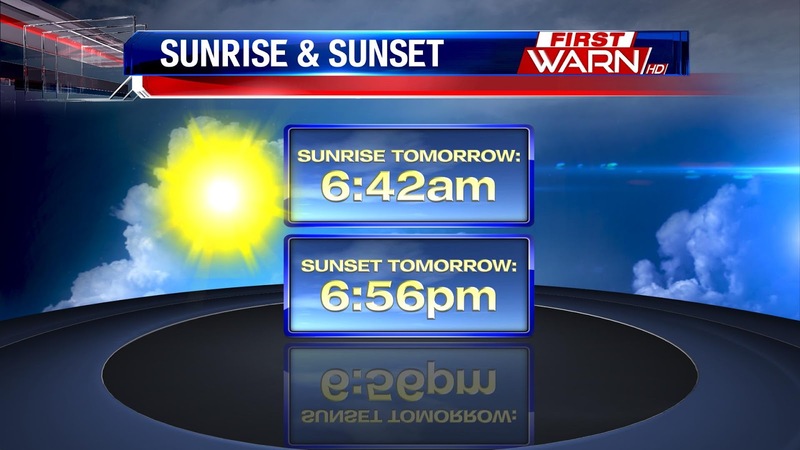 With the equinox upon us, we will see nearly equal hours of day and night. The word equinox is derived from two Latin words; aequus meaning equal and nox meaning night. The sun rising this morning at 6:45am, and the sun now setting before 7pm at 6:52pm! So right now we are nearly equal in terms of day and night and as we all know, the days will continue to get shorter as we head farther into fall. During the fall equinox the sun's rays are directly over the equator at noon. We see the nearly equal hours of day and night because there is a bending of the sun's rays; so while the sun is actually below the horizon even though it looks like its above. The summer like warmth we've see through September so far will continue today and the next couple of days. Highs today will reach the upper 70's and low 80's. With a minimal rain threat into the beginning of next week. Some may dismiss those sayings as just that, weather sayings. But a lot of the weather folklore comes from observation from the past. So, there is a little truth to some of those old legends. One that you may be very familiar with is determining what the upcoming winter will be like by the looking at a woolly bear caterpillar. According to the old legend, the wider the middle reddish/brown section is on the caterpillar, the milder the upcoming winter will be. Conversely, the more narrow the reddish/brown section is on the caterpillar the more harsh winter will be. But the big question is, is it true?? To fully understand just where this old saying came from, we have to look back at the history of how the woolly bear caterpillar became famous. According to the Farmer's Almanac, in the fall of 1948, Dr. C. H. Curran, curator of insects at the American Museum of Natural History in New York City, took his wife to the city of Bear Mountain State Park to look at woolly bear caterpillars. While there, Dr. Curran collected as many caterpillars as he could during the day to determine the average number of reddish/brown segments. Using that information, he tried to forecast the upcoming winter with a reporter at The New York Herald Tribune. It was through this experiment that the woolly bear caterpillar became famous. So, did his experiment of eight years prove anything? According to the Farmer's Almanac, between the years of 1948 and 1956 Dr. Curran's average brown-segment counts ranged from 5.3 to 5.6 out of the 13 segment total (total number of segments of the caterpillar). This meant that the brown band took up more than a third of the woolly bear's body. 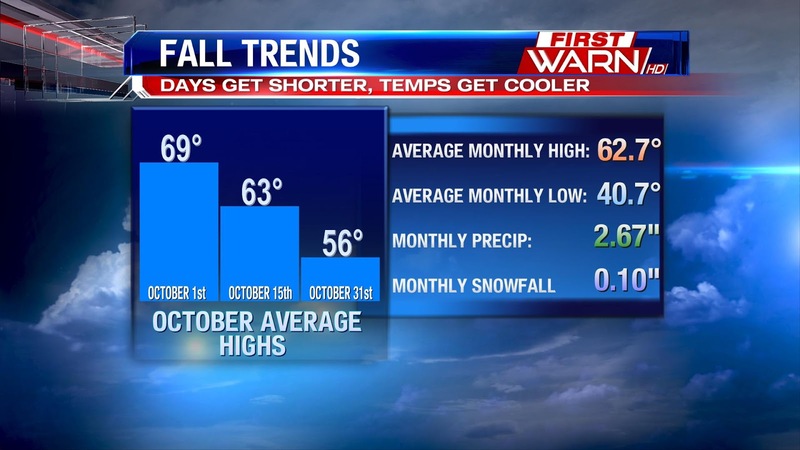 As those numbers suggested, the corresponding winters were milder than average. Now, it's important to understand that Dr. Curran had no real scientific data to support this. He knew his data samples were small and doing the experiment was more of an excuse for having fun. Most in the scientific community think of this folklore as just that, folkore. You'd have to look at many, many caterpillars across the country to try and figure out if there is any evidence that would support a relationship between the reddish/brown band width and winters. But wait...Mike Peters, an entomologist at the University of Massachusetts, doesn't completely disagree that there is a link between the severity of winter and the width of the brown band. He says, "There is evidence that the number of brown hairs has to do with the age of the caterpillar - how late it got going in spring. The only thing is...it's telling you about the previous year's winter." So, while there might not be much truth to this old legend it's always fun to see how many of the woolly bear caterpillars you can find. And while I haven't seen many yet, I'm going with what this little guy (or girl) is telling me...a mild winter! The Autumnal Equinox begins bright and early at 3:21am Wednesday morning. Anyone planning on getting up early to welcome in the new season? Yeah, I'm not going to either. The first day of fall will be beautiful. Watch for patchy fog during the morning commute, but skies should turn mostly sunny by the afternoon with highs back in the upper 70's and lower 80's. The sun's rays will be directly overhead on the equator, bringing nearly equal hours of day and night. 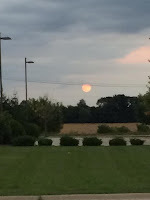 The days will continue to slowly get shorter and shorter over the next few months as the sun's rays move southward. And with fall starting tomorrow, be on the lookout for those changing fall leaves! According to the USDA Forest Service, the factors that tend to bring out the brightest fall colors are a warm and wet spring, favorable summer conditions (not too hot, not too cold) and warm, sunny fall days with cool nights. 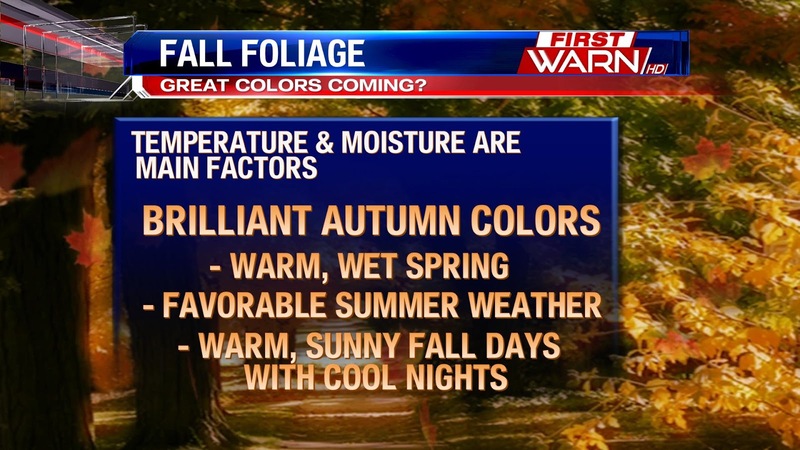 However, warm periods during the fall will lower the intensity of autumn colors. Expect the weather this week to be kind of boring. Upper 70's and lower 80's, little rainfall through next week. How will we keep ourselves busy in the First Warn Weather Center? The above average trend will not only last this week, but likely for the first week of October! A pattern very typical of El Niño. This doesn't mean that highs will be in the 80's and 90's, but with our average high dropping to 70 degrees by the end of September and upper 60's for the first of October, highs in the middle 70's mean above average - and pretty comfortable. So far for the month, highs have been running nearly 4.5 degrees above the monthly average. There have only been a handful of days where the temperature has fallen below. The 10th through the 13th when highs were in the upper 60's and low 70's, and just this past weekend. So, enjoy the weather while you can. Even though we are headed into an El Niño pattern this winter, I'm sure there will be some cold and snowy days this upcoming winter. We're entering the final days of summer and it will be a perfect week to go out and enjoy it. Overall temperatures this week will be warmer than average and rain chances will be at a minimum. It all has to do with our current jet stream set up. The 'polar' or 'northern' branch of the jet stream is placed well north of us; into northern Wisconsin and Minnesota. This keeps the cool Canadian air trapped well north of the area, and warmer air from the south will be able to settle in. This placement also keeps the active weather situated north of the area, in southern Canada. The secondary branch of the jet stream will remain far to the south; sitting in southern California, Texas, and areas to the south east. With this set up, thunderstorm activity stays trapped to the south along the jet. The storms then use up a lot of the moisture available from the gulf. This equates to warmer than average temperatures with out the humidity we often get with it. Climate normals this week are generally in the lower 70's, but temperatures this week will top out in the upper 70's and even another 80° day or two is possible. If you need to finish up any yard work, this is the week to do it. Dry and comfortable conditions will be the trend through Sunday! Enjoy! With fall just around the corner, we're beginning to see signs of it everywhere. Some of the leaves beginning to change colors, nights getting cooler and days getting shorter. Sunday night, the sun set at 6:58pm. Before 7pm! Monday night the sun sets at 6:56pm. Each day we're losing a little more daylight and will continue to do so until the winter solstice, December 21st. Daylight Saving Time ends Sunday, November 1st. The bright side of that is the sun comes up earlier in the morning, but sets a lot sooner at night. As we look closer to the final weeks of September, some of you may be wondering if any of the beautiful fall colors are nearing peak. Well, not quite yet. 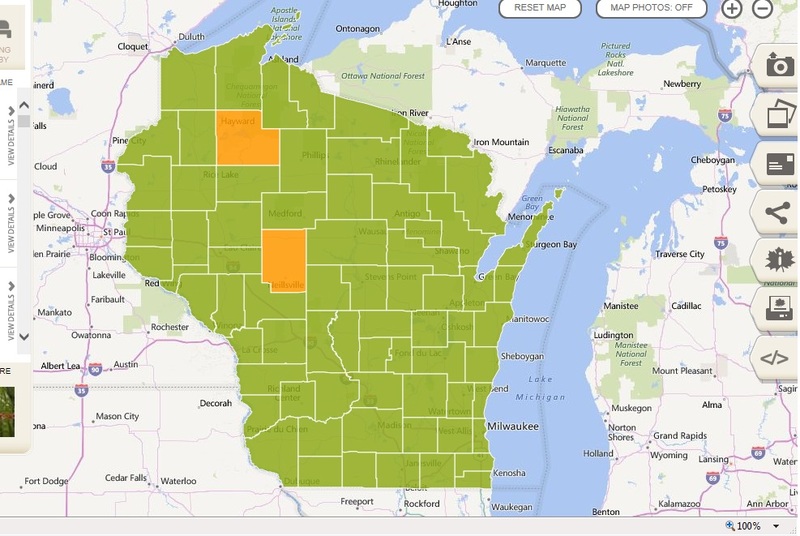 There are a couple counties in Wisconsin, according to the Wisconsin Fall Color Report website, that are about 25 to 50 percent of peak. Driving around you may have noticed some of the leaves beginning to change color, but further south in Illinois we typically don't reach our 'peak' foliage until the middle of October. In the meantime, keep those cameras handy because once the leaves begin to change you'll see them all over! And we'd love for you to share those photos with us too. We have had plenty of rainfall over the past 48 hours across the Stateline, but we are entering a very nice stretch of days as high pressure moves into the region from the west. The center of the high will be near the region on Sunday and Monday, which will keep our winds calm and temperatures cool in the low 70's. The high will slide off to the east by Tuesday, and that means winds will circulate clockwise around it, which for the Stateline equates to southerly and southwesterly winds. Therefore, temperatures will be slightly warmer Tuesday through Saturday in the middle and upper 70's. With the close proximity of the high, expect a mainly dry week ahead with plenty of sunshine for everyone. The high pressure will keep any rain and disturbances off to the west. The only chance for rain that I see over the next week or so comes on Thursday, but that chance is between 10% and 20% as I see it now. It is not impossible for some areas to touch the 80-degree mark at some point this week, especially to the south of Rockford. So areas like Rochelle, Dixon, Sterling, and DeKalb have the best shot at seeing 80 degrees later in the week. 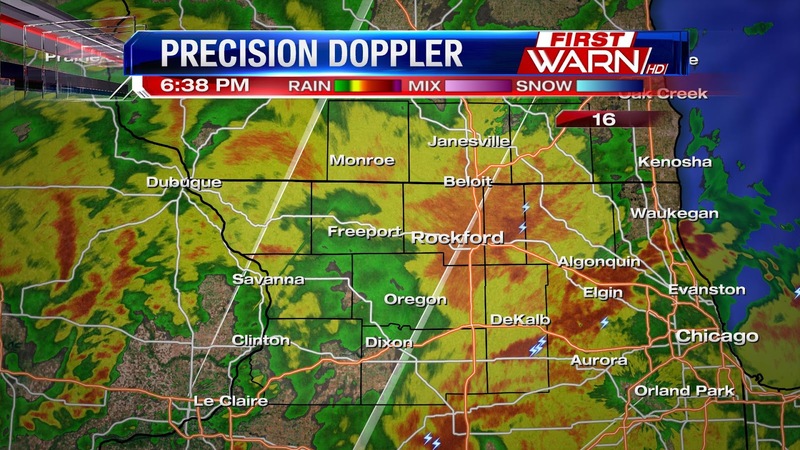 Very heavy rain is moving across the Stateline this evening. Embedded thunderstorms are also moving through with lightning causing issues for any football games being played this evening. 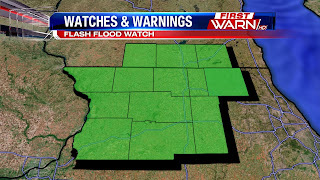 A FLASH FLOOD WARNING has been issued for DeKalb County due to the extremely heavy rain that has already fallen there. It would not surprise me to see some more of these warnings come out through the evening into tonight. The rain will come to an end near midnight and shortly thereafter from west to east. I expect anywhere from 1-3" of rainfall with this system, which, in tandem with the rainfall from yesterday, will cause flooding concerns for several regions tonight. Remember: turn around, don't drown. It only takes a foot of running water to sweep away a car. Therefore, do NOT drive into a water-covered roadway because you cannot tell how deep the water is, or how fast the water may be flowing. We will dry out overnight and see temperatures drop through the 60's into the upper-50's by Saturday morning. 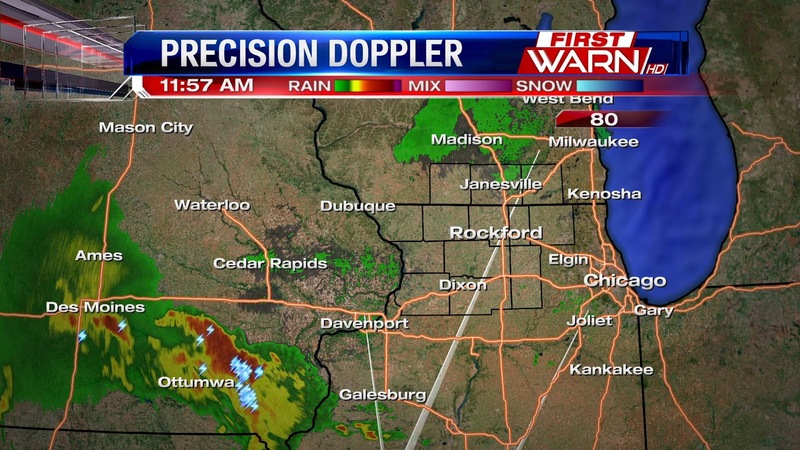 After heavy rain and storms last night and early this morning, so far the Stateline is remaining dry, but that won't be the case later today. 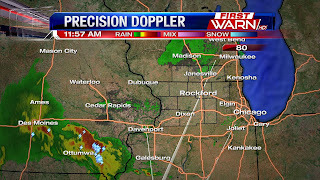 The storms from yesterday fired up with and ahead of a cold front, but now that front is stalled across the Stateline. A low pressure system is developing south west of us, near Kansas and Missouri, and this will be one of the focal points for storm initiation this afternoon. Looking south west of us - along and south of I- 80 - the atmosphere is able to destabilize because the cloud cover is eroding away, and this is where storms are are able to form. 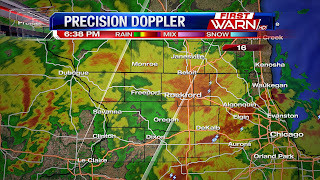 Storms are currently tracking north east across south eastern Iowa. Across northern Illinois and southern Wisconsin we still have a 'cap' on the atmosphere where the clouds have stuck around a little more, and we remain a little more stable. If we see some clearing taking place, our severe threat will go up. With waves of energy riding along the cold front, and the incoming low pressure system storms will begin to fire up this afternoon to the south west and track to the north east. Heavy rain and strong storms will be the threat with these storms, as we have the potential for strong updrafts. Once this first round of storms moves through we should get a break from the rain before more storms fire up later with the main low pressure system this evening and tonight. Look for the second round around dinner time tonight or shortly after, again coming from the south west and tracking to the north east. Heavy rain will again be the threat with these storms, as well as strong to severe storms with hail and gusty winds possible. The combination of the low pressure and stalled front will allow for strong updrafts. A good one to three inches will fall, but 3-5 inches is also possible so a Flash Flood Watch is in effect tonight at 7pm through 7am Saturday morning. But the placement of the low pressure itself will be key in how much rain we see. If the low pressure pulls further to the south, the rain threat will go down. Why So Windy? Lots Of Rain Ahead?